Please contact the drop-off person to ensure drop off is done at a suitable time. Please note, I am unable to take calls between 12-4pm. SMS's are preferred. Boxes can be left with the guard for this drop off. Find a shoebox that does not exceed the size of 30cm wide x 40cm long x 15cm deep. Cover the shoebox. The box and lid should be covered separately. 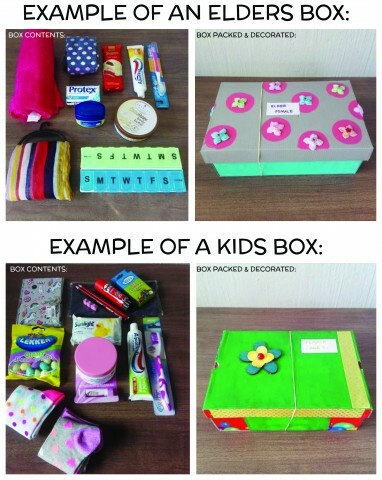 You may decorate the box with paint, stickers, paper and other art work, appropriate for the age of the child/elder. Label the box: For the kids boxes write the "age & gender". For the elders write "Elders & the age"". Seal the box with only an elastic band. RSBP reserves the right to return boxes that do not comply. RSBP reserves the right to remove or add any items from your box. Strictly, no cash accepted. Sharp objects, medication, electronics, battery operated objects, glass or liquids are NOT allowed. All items must be new. Unless otherwise stipulated. Please ensure that all items are age appropriate. Sweets should not contain nuts. Strictly, no zakat accepted.